We are packing up and getting ready to move locations. The walls are tumbling down, as we pack up our fixtures to move to our new location at 267 Pemberton Avenue. 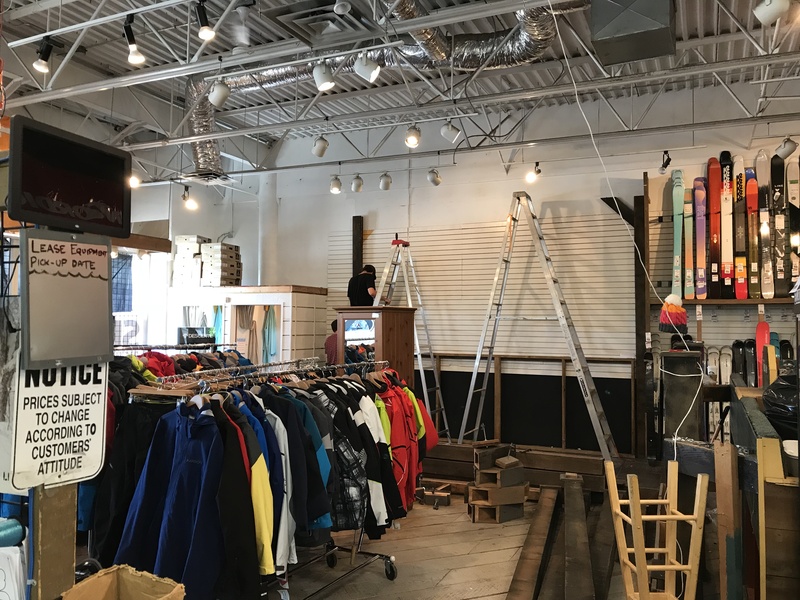 We will have a few weeks where we are not open to the public as we get things set up in the new store. It is an exciting move for us as we will be able to organize the new store with a more efficient traffic flow. If you have been in our store on a Saturday between November and February, you know what I mean. This also gives us a chance to display our merchandise in a more organized fashion. Let me take you back to 1988 when we moved into our store on Marine Drive. • Snowshoes, no one used snowshoes, those big ugly wood and mesh things you strapped to your feet. Only hunters and trappers used them. They certainly were not sold in your local ski store. • Ladies Skis are you kidding. There were just skis. Women bought the same skis as men, only shorter. Why would you build and sell skis specifically for women ……… because we are different! So many changes in thirty years and it was time for us to change as well. We will be working hard at the new location all summer long getting ready for next ski season. Watch for updates here and on Facebook.